Just across the Schuylkill River from all the festivities of the NFL Draft, the 123rd Penn Relays carnival has been running all week long. On Saturday alone, 47,420 spectators packed into historic Franklin Field on the campus of the University of Pennsylvania. The big events today as usual featured USA vs. The World. The US and rival Jamaica split the 6 events, with Jamaica winning three for the first time. The Oregon Ducks women swept the Championship of America sprint relays (4x100, Sprint Medley, 4x400) and set Penn Relays' records in each race. 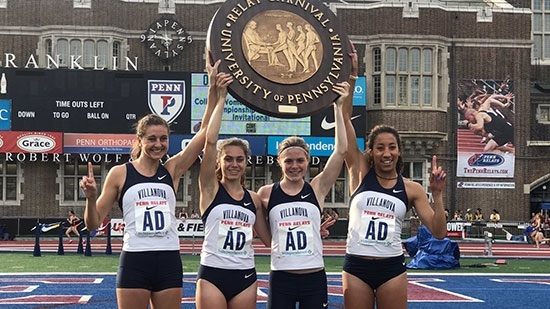 The Villanova Wildcats women swept the Championship of America distance relays (4x1500, Distance Medley, 4x800). Villanova's teams included Siofra Cleirigh Buttner, Angel Piccirillo, Nicole Hutchinson, McKenna Keegan, and Bella Burda (4x1500). Villanova's Siofra Cleirigh Buttner was named College Women's Athlete of the Meet for the Relay Events. 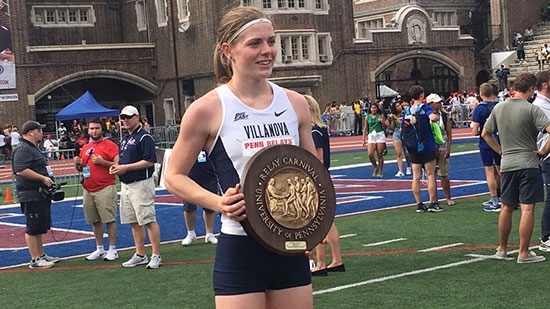 Villanova's Siofra Cleirigh Buttner was named College Women's Athlete of the Meet for the Relay Events.